As you consider the move to a retirement community like Woodlands, you may be curious about what your actual future home may look like. To describe what it’s really like, a few of our residents shared their stories and described how much of your home can be customized with the home customization options at Woodlands. Since moving to Woodlands in November of 2017, Minnie Valentine says that she has been very happy with her choice. One of the reasons she enjoys her home at Woodlands so much is that she was able to choose some custom details to make her home as bright and airy as she desired. While she enjoyed choosing her favorite paint color, bathroom tile and countertops to maximize the bright feel, Minnie’s favorite custom touch is in the kitchen. For the kitchen cabinets, Minnie chose glass-fronted cabinet doors. 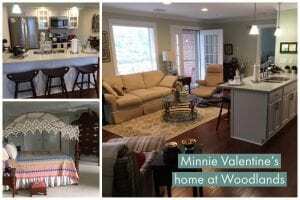 Minnie’s home isn’t the only bright part of her life at Woodlands, though. Minnie mentioned that her lifestyle has blossomed through meeting new friends, enjoying exercise classes and knowing that her children are very happy with where she now calls home. Maxine and Jim Brammer moved into Woodlands in late 2017, and Maxine noted that they had some adjusting to do after moving from a house with four bedrooms to their smaller but comfortable home at Woodlands. 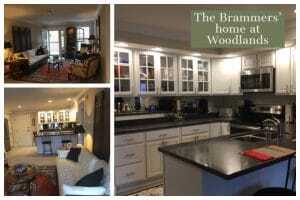 The Brammers mentioned that while they don’t have as much space as they used to, they know that their home at Woodlands has just what they need. Being able to add some special, personalized touches to their new home, along with still having their prized possessions, makes it a great place for them to be. Maxine and Jim Brammer’s home has many of their favorite touches from their former house (like the oriental rug seen here), but was a perfect “clean slate” for where they are in life. Maxine and Jim’s daughter, Angie Lovejoy, likes how her parents were able to start fresh while also making the space feel just like home. Wanda Cummings is a former theater teacher, and she wanted her home to reflect a feminine yet classic aesthetic. Since Wanda obtained her home in June of 2018, she has received some expert help in creating the exact look she wants. Summer McGregor, a family friend and professional designer, assisted Wanda with curating furniture and decorating her new home. One of the custom touches that Wanda likes most is a special wallpaper that Summer chose, which is based on a painting from a famous Dutch artist and adds a bold but classic touch to her home. Another European-style element is the chandelier that Summer chose for the home’s “turret” area, which is in the French provincial style. Wanda chose a unique wallpaper, and her home was customized to reflect a feminine yet classic aesthetic. “With the chandelier and the natural light coming in, there’s a really nice glow in the evening,” Wanda said of her new home. Wanda’s home is tailored to her preferences, and so is her lifestyle at Woodlands. She mentioned that she is excited to have common interests with new friends and can stay socially active with hobbies she likes such as art, card games and movies. With Minnie, Maxine and Jim, and Wanda in mind, it’s easy to see the possibilities for making your home just how you like it at Woodlands. Reading their stories is just the beginning though. Stop by for a visit to see for yourself – we’ll be happy to show you around! Simply click here, or call 304-697-1620 to get in touch.